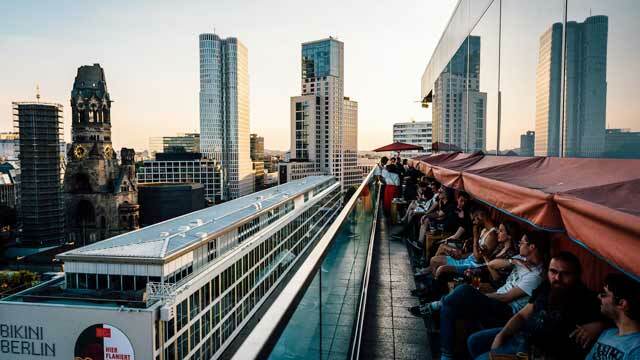 A complete guide to the 7 best rooftop bars in Berlin in 2019. For starters: Which are the best rooftops in Berlin? 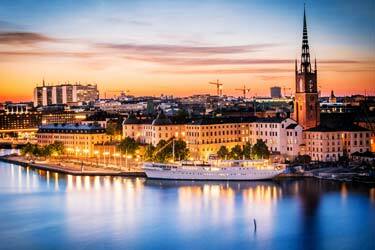 A city really blooming, being the third most-visited city destination in Europe. 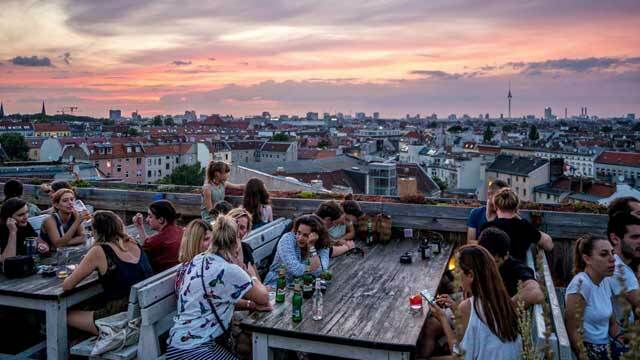 Between all the culture, history and beer houses you should also check out the best Berlin rooftop bars. 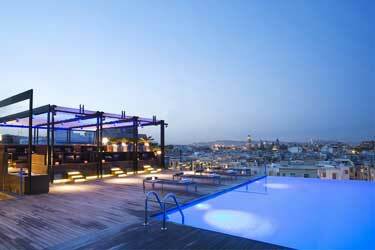 Starting here, with the ultimate guide to the best roof terraces available here. Here you'll find all info you need about each rooftop. Opening hours, dress code, pictures, maps and much more. 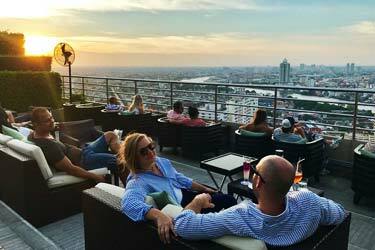 So, which is the best rooftop bar in Berlin? 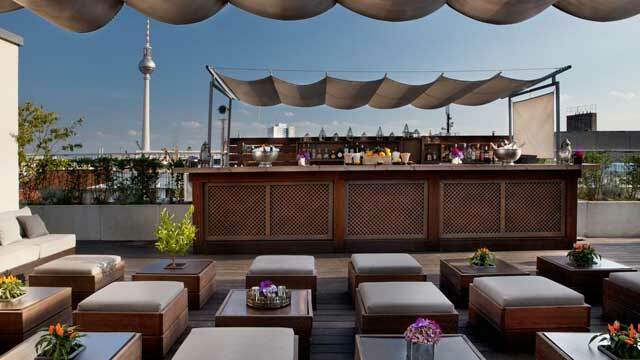 Start scrolling down and find the Berlin rooftop bar best suited for you. Or use the Berlin rooftop map in the bottom right corner. Perched on the 10th and top floor of 25hours Hotel Bikini Berlin, Monkey Bar offers unbeatable panoramic views over the city and the Berlin Zoo. Trendy, vibrant and cosy-chic in setting, the rooftop bar offers a wide range of creative and crafted signature cocktails, along with some wine, beers and various bar bites from the adjecent NENI restaurant. Buzzing and popular rooftop, with live DJs every night and usually a large crowd. 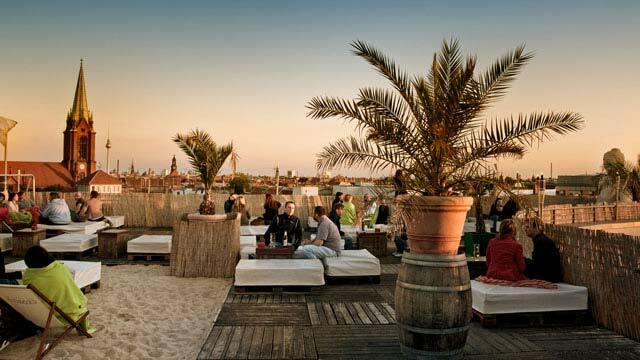 On top of the mall Schönhause Allee Arcaden you find the highest beach rooftop bar in Berlin. Decorated with big slumber sofas, deck chairs, palm trees and real sand, this is truly a hidden oasis above the concrete jungle, that also comes with a fantastic view of the city. Open during summer season, the rooftop bar serves a mix of pizza, burgers, dim sum and summer BBQ along with a wide range of refreshing and summer-inspired cocktails. Great atmosphere, live DJs and beach-side vibes. Perched on top of the luxurious Hotel de Rome, this stunning cocktail lounge and rooftop terrace provides a very nice and impressive view across the historical center of Berlin. Open to all, daily during summertime and on weekend nights in winter (7-9pm), the stylish terrace is decorated with comfortable Dedon furniture and from the rooftop bar you can enjoy coffee, homemade ginger lemonade, iced tea along with specialized and mixology champagne cocktails. 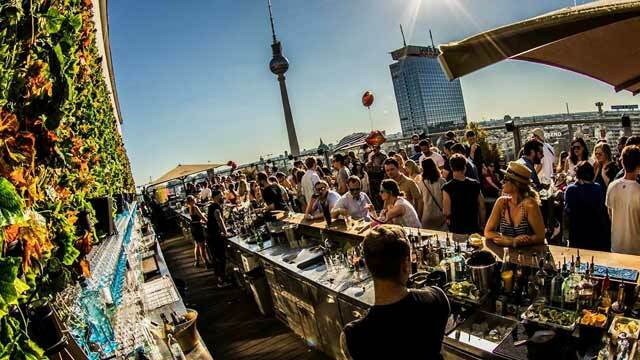 Located right by the Alexanderplatz, Roof Garden at House of Weekend is the go-to spot for sky high vibes. The roof terrace is perched on the 17th floor, 60 meters up, with amazing skyline views over Berlin. 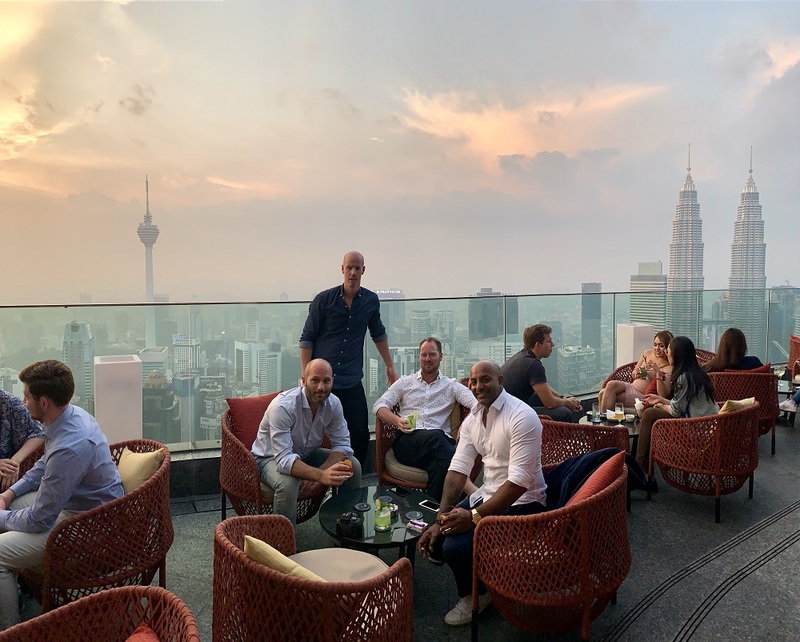 A summer hot-spot, the warmer nights means themed events at the terrace, often including BBQ and always including great drinks and top atmosphere. As the night wears on, the party continues at the Club Floor below (also open during weekends in winter). Expect a large and trendy crowd enjoying the urban chic setting and skyline views. Located in the heart of Berlin, Hotel AMANO comes with a fantastic lobby-bar (called AMANO bar), that during the summer months expands up to the 6th floor rooftop and gives everyone the opportunity to enjoy great cocktails with amazing skyline views. Elegant and modern in interior, the rooftop bar serves creative and crafted cocktails created by an awarded bar team. Loungy and sophisticated in vibe, this is a great spot for summer after-work and beautiful sunsets. Located on top of the parking garage at Neukölln Arcaden, this is a bohemian place and a cultural roof garden. The spacious terrace comes with generous and green outdoor areas, a panoramic view of Berlin along with cozy cottages offering concerts, DJ program, readings, cinema and more. Definitely an eventful place! Very urban and creative in decoration, the rooftop bar offers ice cold beers and refreshing cocktails, along with breakfast, lunch and a changing dinner menu. A bit hard to find, but a very popular place, so be in good time. Soho House Berlin is a lovely boutique hotel, located close to the Rosa-Luxemburg-Platz in the Mitte district of Berlin. As with all other Soho House venues around the world, to access the rooftop you are required to be a resident at the hotel or a member. If you are, there is an amazing rooftop lounge waiting for you. 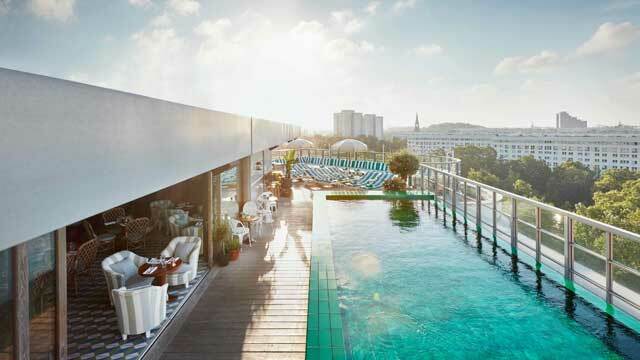 Here you find a fantastic rooftop pool (always heated to 26 degrees celsius), great views, fine cocktails and a retro chic style indoor and outdoor rooftop bar and terrace. Discover the biggest collection of Berlin activities, guided tours and skip-the-line tickets. Anything you want you'll find right here. 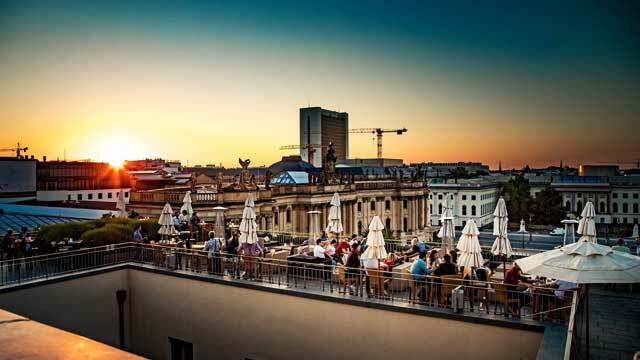 Berlin has a variety of fine rooftop bars with great views and good food and drinks. 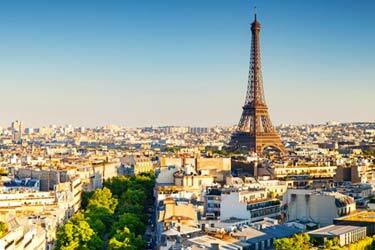 Summer is the best time to visit if you want the most out of the roof terraces. In Berlin you can find a great variety of nice view spots. 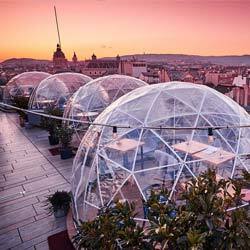 Some at luxury hotels, or privately owned rooftops located on the roof of the car park or beach clubs on the roof terraces. The places here are very spread out on the city's major surface. 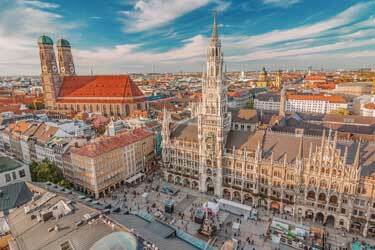 However, most have close proximity to the city center, but considering how widespread the city center is, it is not walking distance from the roof terraces for those who want to visit multiple rooftop bars in Berlin on the same day. Although the season for outdoor drinking is very short in Berlin - mostly because of the climate - there are a lot good rooftos here. The best thing here though is the variety diffrent styles and interiors. There is truly something for everyone. Luxury beach-club, bohemian etc. which makes it very hard to say what the typical Berlin rooftop bar looks like. Use the map to search for the best ones, that are closest to your destination. And here's a list of the best hotels in Berlin with a view. Berlin is Germany's capital and the largest city in the country. Berlin is through its cultural and historical heritage one of Europe's best known and most visited metropolises. Berlin is a major transport hub and an important economic and cultural center of Germany and Europe. Institutions such as universities, research centers, theaters, museums but also festivals, nightlife and architecture of Berlin has a worldwide reputation. Berlin has become known as a real party town. People from all over the world who like techno, house and rave comes here every week. But the atmosphere at the rooftop bars in Berlin is a little bit slower. Both Germany and Berlin is very famous for its beer. And at the rooftop bars in Berlin there are plenty of good beer varieties to choose from. Of course there are also lots of different cocktails and fine wines for those who like it. When it comes to food, the most common thing to eat is classic bar-bites at Berlins rooftop terraces. Burgers, hot dogs, salads and so on. Berlin is like many other cities in Europe rather low built - in spite of being a big city. But despite this, you can get great views from the rooftop bars in Berlin. The highest is around 7-9th floor. The view from the rooftop bars are often over the rooftops of Berlin, TV tower and the cathedral. Very nice for those who want to get memorable photos of the town's picturesque views. Berlin is a city with many attractions and historical sites for tourists and history buffs. Or how about the following: The Berlin Wall, the disused Tempelhof airport, Neues Museum, Brandenburg Gate, the Cathedral and much more. Berlin also has lots of cozy cafés, nice brunch places and not least, a plethora of bars. Here there is almost a nice bar in every neighborhood. Perfect for those who like to hang with the locals and drink beer or wine. Regarding sports, Berlin has a football team in the German Bundes league called Hertha Berlin. The little chilly climate and the northern location of Berlin makes the city does not have a greater range of rooftop swimming pools. However, at Soho House Berlin, there is a very luxurious rooftop pool, which is heated and has a fantastic view of Berlin and the famous TV tower. 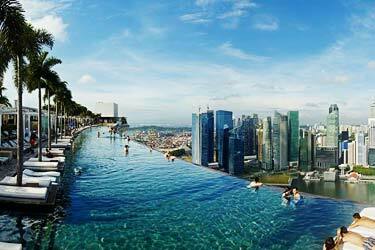 This rooftop pool may be used only by members or residents of the hotel. So if you want to take advantage of Berlin's best rooftop pool, you should reserve your hotel room at Soho House Berlin with us. Then you also get some of the best deals and prices on the market. Berlin has two quite large airports. Berlin Tegel Airport, located near the center and then Berlin-Schönefeld is located a bit outside. Here it lands and lifts, plenty of airplanes every day - which makes it very easy and convenient to get to Berlin from the rest of the world. Berlin has many good hotels. Some of them are equipped with cool rooftop bars. The hotel prices in Berlin varies depending on the standard, but you can do incredible clips here if you just look a little bit. At our website you will find the best hotel rates in Berlin. Book direct on the site and get a hotel with a roof terrace.